Garance was shooting her friend Jessica yesterday so I hung out with Jessica’s boyfriend Jed. Jed is a very cool artist with a very cool laidback LA style. I love that big “grandpa-style” cardigan he’s wearing in this shot. It is always a little sad when you see things you’d love to wear but know that it would never look good on you. A chunky cardigan like his can only be worn well by someone bringing none of their own chunk to the collaboration of man and knitwear. It is a sad truth but I am wiser for knowing it and planning my wardrobe accordingly. I find you re so talented !! Thanks to You , All the people are so beautiful !! I wish I could pull off a pair of alarming red jeans BUT sadly my wife thinks I'm pushing it and I just can't shake this femininity I associate with the colour. "A chunky cardigan like his can only be worn well by someone bringing none of their own chunk to the collaboration of man and knitwear. It is a sad truth but I am wiser for knowing it and planning my wardrobe accordingly." Haha …. very well said. A thing many of us have to remember. What a captivating image. Why is he so pensive? What is he thinking? What happened next? Perfect! I love this post, and this photo, because it totally reminds me why I love "chunky" sweaters: he looks so comfortable and cool. I wonder what he is thinking…. Agreed. A great benefit of paying attention and alas, of growing up is learning what looks good on you. Many looks in your blog are specific to their wearers and beware from trying them at home! I've met you before . . . you don't have any "chunk" to speak of whatsoever . . . But I credit you for knowing what you feel good in and what looks good on you. Jed is a cutie! I don't what it is but beards look great. Depends on who wears it though. Looks good on him, no question bout that! Shame I can't grow a decent beard. I know what you mean. But I do love the cardigan on him. Great picture. i'm eternally hunting for the perfectly worn grandpa style cardigan..
i wish I could rock that beard! great style though. VERY nice look. Great shot. I love the collar. It looks so cozy. The colors of the orange peel, clippers, and cocoa-like bark make this such a beautiful picture. Huh? I haven't ovserved you looking 'chunky'. Quite the opposite. You look spiffing. I think larger framed men would look good in a chunky cardigans if the the patterns are vertical and towards the center. The orange peel, the secateurs, the simian forehead, the tree bark, the glass of wine…. these elements come together to create a very beautiful image. There is something about this guy. I love this shot and appreciate the photography, but the best part of the whole photo is the remains of the orange…just saying. So true about chunky clothing. Cable knit sweaters are not my friend. I really like Jed Lind's work, and his sweater. Is he in the midst of making a sculpture on the table? Don't sell your self short! LA shots are so rare here, so it's great to see one, especially one of such an LA guy! Hope to see more of my city's fashion featured here! you could totally pull off that look scott, i thought you actually have already too,well i hope you get some more good shots before you leave! "It is always a little sad when you see things you'd love to wear but know that it would never look good on you." Amen brother. It's especially sad when you see other girls wearing something you wish you could pull off. It wouçd be interesting you to take some pictures of Jed's work, hein? What a lovely, lovely shot. Completely unstudied and real. Natural, relaxed, soulful. Thank you. ah i know your pain…..wearing wide leg pants on a short stature like mine….too clownish it wont work! Nice to know that even someone as handsome as the Sartorialist can't wear everything…. gorgeous guy, gorgeous place. Here in Boston it is 15 degrees and windy. the simple color scheme and sense of effortless makes the entire look. Cardigans with shawls are great!!! You can dress them down, as in this picture, or you can dress them up. They make you feel and look comfortable, which is key in being a good sartorialist. this is what people should think of when they think LA. 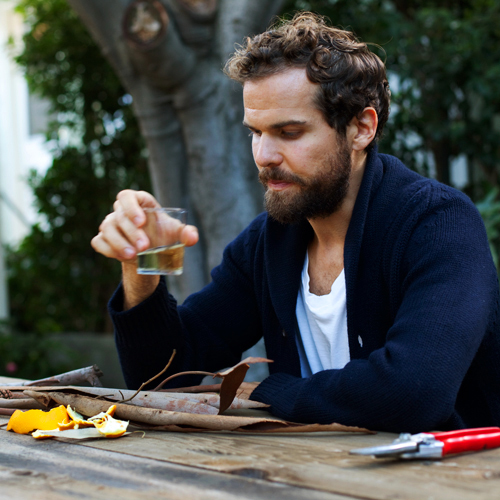 thick curls, a decent beard, white wine in the park in december, a classic sweater, and fresh fruit next to eucalyptus bark. that's my city. I have that problem ALL the time… (see great style, but know I could never pull it off myself!) haha. Oh well. You handsome devil. Canadians wear shawl collars better. I have got to remember this for next time I need a little sliver of color in my shot – bring along the Felco snips! LA style is very comfortable and somehow you always look good… I guess when it comes to style you just have to feel good in it and if you do then you look good!!! welcome to los angeles! i can't wait to see your view. I lived in Los Angeles for twenty years of my life, and was around quite the creative crowd. Theatre students, musicians, writers, and the like. In all that time, I can't recall seeing such relaxed and spot-on sartorial taste in a man. I'm a big fan of cardigans, but the beard is great. Living in the Carolinas now, I see far better innate style in both men and women then I did in LA. Sart, if you have not already been, I suggest visiting Charleston, SC in late spring/early summer (May). It's guaranteed to produce some great shots. No knock on LA, but I've seen far better natural style elsewhere. I thought you would be able to pull it off! Why not just try and give us a gander? what? fashionable bearded men? this is madness! but im not gonna lie. looks good! Any man can look good in knitwear, and he doesn't have to be "slim" to pull it off. This boy is flat-out adorable. very nice "moment in time" snapshot. Brown liquor in frame doesn't hurt either to give a little depth to the moment. Great sweater, great hair, table, it all comes together nicely. "A chunky cardigan like his can only be worn well by someone bringing none of their own chunk to the collaboration of man and knitwear." Best laugh of the day! Thanks!! Scott, that is such a good point. Sometimes it's just best to admire and appreciate a garment, or a look, and have the wisdom to know that as great as it looks in that moment, it's not for you personally. On the Sartorialist…haircut looks great!! man and cardigan truth so very well said. Scott, I'm afraid I didn't understand your comment. Do you mean you can't wear thick garments because you're overweight ? You certainly don't look it. I know what you mean about feeling a little sad when you see something amazing on someone and you know it wouldn't suit you! I can't carry off the studs-80's-grunge look quite so well, and kind of wish I could sometimes. Fantastic shot, but not a very typical sartorialist moment, is it? I really like it though! Perhaps it's the man wearing the cardigan that makes it look good or maybe it's the plain t-shirt underneath! The photo composition is stunningly casual but precise, as the pulled out tee with the sweater. He needs a fat steak and axe in front of him. Neat photo. Very thoughtful look. I wonder what he's going to make with – is that eucalyptus bark? – and orange peels? Love the grandpa-style beard and his hair is so cool and careless! Forget the cardigan – I'm appreciating the facial hair! Great shot too. The lighting. The orange peel. Tea in hand. Cutters. It's awesome. That cardigan makes me feel cosy just looking at it. This post for instance is one of the reasons I like this blog! your eye (the choice of the people you shoot) and your voice (your comments) show a point of view, a view of the world that injects life to life… I identify with it and enjoy it so much! This post is so funny, so real and the comment has made me laugh (…be worn by someone bringing none of their chunk to the collaboration of man and knitwear!…).Wonderful sense of humor. Sart, lovely picture & great looking man but I beg to differ Re: the chunky factor in – as you so aptly put it – the collaboration of man and knitwear. just one word: The Dude's cardigan. probably the single most celebrated piece of chunky knitwear on the single best male example of confident chunkiness: Jeff Bridges in The Big Lebowsky. I know he can't be matched but – and this is really just a matter of confidence/insouciance – he will always be a great source of inspiration for the rest of us chunktastic people! Not to sound like a teenage girl, but hell yes!!! I really think that this is a beautiful photograph. Effortless. Great thrown together look. I'm sorry but over where I live his style is generic to the folk crowd who are inspired by Bon Iver etc. Have to disagree, Sart. Chunky blokes look great in chunky sweaters; remember Ralph Lauren Vintage Dude in Manhattan in your pic from a couple of years back?. In fact I'd go further and say that slim men shouldn't wear chunky knitwear because it only exaggerates what they don't have. I admire the pic more than the style of the gentleman. The picture is great, I love the soft colours and the nice touches of red and orange on the over-all dark colours. really beautiful indeed. Really nice that it has the story of it's own, nice composition. I like the jackey, you have reason there are some clothes that you don't know how to dress, I didn't know how to dress pads without to look ridiculous. I like the tree bark, branches and peel the sitter is contemplating. They are beautiful. And I love the sweater too. I have bought 4 in the past year…..
Great, great look. Reminds me of Jason Patrick in Rush. Nice shot. Love that Calif. style. i have to tell you tht its not just ur subjects but the quality of the images tht u click are so awesome. so many of them blog but urs are the best to look at. really the D5 was a smart choice, any plans for the D7? My wife refers to my cardigan as the "Mister Rogers" look. Oh his hair are so cool ! Amazing picture of serenity ! Some people have faces that speak volumes and also, make you wonder what they've experienced in their life. He's got one of those faces. Inspiring, thoughful shot. Beautiful shot and thoughtful text. I have always loved plain crisp white T's with a navy cardigan. He has lovely hair too…nicely unkempt. So, so true, Sartorialist. To quote a favorite knitting book (Knit So Fine) – Even Barbie looks fat in worsted. Wiser words never said. It's so great you're in Los Angeles! Show us many pictures. I'm actually digging the tree bark and orange peels. Fantasic photo…love that spot of red and yellow…and the blue shadows on the t-shirt…lovely! this is probably my very favorite shot i've ever seen on this page. it's just.. great. It's the man inside the cardigan. He's enigmatic. Maybe he's mad, maybe he's happy, maybe he's uncomfortable … who knows but him. He could wear anything and look good because his disposition is unavailable. It draws you in… wanting to know more. If you see something you like in a store, I think it's always worth trying it on, regardless of what you normally wear or what you think suits you. I've observed many a person defying convention by wearing a style I never would have paired with their body type – some of them on this very blog! To the guy who said he wanted to wear red jeans, I say do it! Hell, sometimes you just have to throw caution to the wind and go for it. Chunky cable knits are equivalent to a large print/pattern, which larger folk are encouraged to wear. As you know, the scale of the texture makes them seem smaller and more proportionate to their clothing. Everything I wanted to say about the man and his cardigan + beard has been said by more articulate commenters above, so now I'm just telling you that I really love the triangle made of primary colours (yellowish orange peels, navy blue cardigan, red secateurs) in this picture. OMG You are Sooooooooo talented! Everyone of these pictures I Love, Love, Love! You are hands down THE BEST STREET FASHION picture take out there. Keep up the Clicks! I don't know much about your style, but I'd say you were 'very cool'. The world seems to agree with me. I particularly like the sort of roughness that this guy exhibits–kind of like a gruffness–in contrast to the more delicate aspect of his cardigan. The beard and the hard wood tables and the metal tools vs. the cardigan and the glass. Really interesting juxtaposition! His laid back style certainly comes through in this photo. Great shot. You're 100% right about how chunky people and chunky knitwear don't mix. Unfortunately It applies to women too–chunky knits made of unusual yarns and colors are among my favorite things but I can't wear them at all. I love this cardigan. It looks really similar to a cardigan Gap just got in. I think you are right. There are few men who can do a cardigan without making themself looking less man. This guy, he rocks that cardigan. PS. I am so jealous that you get to hang out with Garance everyday. I get excited about her every post. I think its less about the sweater style and more about if or how you see yourself in it. Many have said here that you'd look good in this style sweater and I agree. But if you don't feel you'd look good in it, 9 chances out of 10 you won't. So much of life is about attitude and how we feel. It's not that chunky. I would say medium to mild chunk for this cardigan. Cool look here! Nice but still prefering Gants mens lambswool sweaters and The new range from Reiss London. thank you for shooting someone here in LA. i feel like our city has it's own style and some style gems that need to be recognized. perfect shot! if theres a chilean…..he looks exactly like Claudia´s boyfriend in "los Ochenta" I dont know the name of the actor. perfection. the scotch in the afternoon really completes it. You are wrong Sart about yourself and the principle! It takes one to be Mature; not simply possess the Stature, to wear certain items of clothing. We are canvasses not mannequins. We adorn ourselves to evoke a mood or an outlook. We are not hangers on which we can only hang the “appropriate” clothing. You and I are quite similar in build and stature. Yes, I indeed will wear huge patterns, horizontal lines, and chunky knits when the mood arises. I follow the principle of “Free your mind and your posterior will follow.” Peace, out. I love the juxtaposition of the colours — navy between orange and red. would love to see you write more often! Practically every new wanna be hip design label and some that should know better has latched on to this and has the same big "grandpa style" cardigan in their fall 09 lineup. Yawn. I want to see people whose style isn't fed to them. I love the nonchalant way that he can wear that cardigan so casually. As you say, not everyone can pull it off, so it is refreshing to see this style when not too much thought has gone into it. fabulous. what is that stuff on the table for? I respectfully disagree. A handsome, fit man (like those you photograph) can wear absolutely anything and make it look good. A beautiful fit woman (like those in all your pictures) can wear absolutely anything and pull it off. That's why clothes always look wearable on the runway (even the most ridiculous clothes) but end up looking merely ridiculous on the people who buy them. It's the people who either look good or don't. The clothes are irrelevant. If you love it wear it. That's the ultimate – enjoying yourself! As a Beachwood Canyon resident, there are many men with this look patrolling my 'hood. Although the grandpa sweater look is quite endearing, I have to agree with you, Scott, not too many can pull it off. Going to be really upset to know if this was taken in Hollywood or anywhere I might have been and not seen you nor Garance. My partner absolutely refuses to wear cardigans but I hope I will finally manage to persuade him he doesn't look silly! We should all learn to knit and make unique things but unfortunately, I'm not very dexterous and I'm rather impatient. Oh well! It´s good planning the wardrobe after body type. I really like his cardi too. what a great style, very unagitated and cool! First, I gave my girlfriend your signed book for Christmas which I got when you were in London in September. She thought it was brilliant. Second, I think anyone can pull off chunky knit wear in the right combination. I'm seeing it used a lot more liberally in Copenhagen and Stockholm than other places. We love your blog and this post is really brilliant. I always feel like slouchy clothes are meant for the comfort of the home.. but this gentleman wears it perfectly! That's my old roomate from university in Montreal! Hi Jed! Hi Jess! Your pictures are GREAT. I can see Jed's personality through your camera. Wonderful weblog, I'm hooked. ;) Keep up the great work! Yeah, he's rockin' the LA Style but, like so many… even most… of the Hot Dudes in Los Angeles, he's Canadian (and so is Jessica, his hip wife). I love this old cardigan worn with a very basic T-shirt!